After defeating the spell forge’s guardians, the group decided the rest and recover in the forge room. After just a few minutes of resting, Snowg started climbing onto the stone pedestal that held the brazier. When Turenim asked him what he was doing, he said he had to pee. Turenim told him that would be a bad idea, and Snowg agreed, and said he would go outside. “Nooooo!” the group all called out collectively, and suggested he should just pee in the corner. Pippin thought peeing in the forge sounded like a good idea. Turenim tried to stop him, but Pippin used his boots to leap over Turenim and landed on the pedestal. By the time Turenim and Lee pulled him off, Pippin had already relieved himself. The rest of the group reprimanded him. Meanwhile Snowg left the room into the starry cavern. Turenim looked outside and found him relieving himself on the wall outside the door. He urged Snowg back into the room. Turenim was very concerned that the pee could alert enemies to their presence, so after some debate, Albrecht and Snowg went back outside and Snowg cleaned up the urine using Julious shirt as a rag. “Did you hear that?” Snowg asked Albrecht, while they were in the starry carven. “What did the voice sound like?” Albrecht asked, and Snowg shrugged his shoulders. The group began to question whether it was safe to continue resting in the forge room. They debated going back to the storeroom. The discussed how they could leverage Lee’s alarm spell. Snowg suggested that he could hide outside and alert them if he saw anything, but he didn’t know how could alert everyone without revealing himself. Eventually they decided to rest in the side room to the north of the forge room, with the zombie bugear bodies. Snowg suggested that he could hide in an alcove 30 feet outside the room and Albrecht could see him with the door slightly ajar, so that he could signal to Albrecht if anything was coming. Ultimately they all agreed with this plan. Lee kicked open the door and threw his hand axe at the lead bugbear. The hand axe thudded into its chest and bounced off, only slowing it slightly. The bugbear roared and slammed his morning into Lee in retaliation, knocking Lee aside and charging into the room. A second bugbear pushed its way into the room and swung its morningstar at Moula, but she ducked under the wild swing. Moula turned and smacked her quarterstaff into the first bugbear’s head twice, wobbling it. Albrecht stabbed at the bugbear but he stumbled and missed wildly. Turenim swung Lightbringer at a bugbear, but it bounced off its shield. Altilius maneuvered himself by the door and blasted the four bugbears in the rear with burning hands, especially searing the one in front, who brought his morningstar down on Atilius. Atilius cast shield in reaction, but the crushing blow dropped him nevertheless. Pippin darted into the fray and stabbed at the lead bugbear, but did not penetrate its defenses before he rolled away from the melee. Julious swung his scimitar at the same bugbear, but missed. Lee drew Talon and slashed it across the lead bugbear’s chest slicing it open, bucking its knees. It refused to go down, and swung weakly at Lee, but barely had any strength left to swing. The second bugbear swung mightily at Lee, but the blow bounced of Lee’s new Dragonguard breastplate. The bugbear that had smashed Atilius and the one next to it barged into the room, both swinging at the monk from opposite sides. The combined blows dropped her. Albrecht cast healing word on Moula, reviving her, and stabbed at a bugbear, but still could not penetrate its hide. Turenim cast spare the dying and healing word on Atilius, leaving him with no more healing spells. Atilius crawled back against the wall and cast burning hands again at the same four, especially searing the two in front. Pippin dashed back into the fray and stuck his shortsword into the wound Lee had carved in the lead bugbear, ripping it open, and killing it. Julious swung his scimitar again, and missed again. Lee slashed Talon into the second bugbear's shoulder. The bugbear swung back, but Lee was able to evade the blow. The third bugbear brought his morningstar down on Atilius again, and again slammed through the shield Atilius cast in reaction, but this time Atilius was able to maintain his footing, but only until the fourth bugbear caught him with a reaching swing. The second bugbear smashed its morning star at Moula, dropping her. Another bugbear swung at Atilius, but he scrambled out of the way. The last bugbear swung at Albrecht, but missed. Albrecht reacted by reviving Moula with healing word, Turenim stabilized Atilius with spare the dying, then Albrecht revived Atilius with healing word. Throughout the fight an internal argument broke out with Albrecht suggesting they should retreat into the forge room, and Lee fearing the consequences of withdrawing. Atilius rose once more and cast burning hands a third time at the same four bugbears, killing the third, who was closest to him, and searing the fourth. Pippin rolled up to Atilius and split his attacks, stabbing the fourth, burned bugbear, finishing it, and the second bugbear, injuring it further. Julious took a step back and summoned the spectral appearance of the bear spirit totem, surrounding the party with its strength and endurance. Atilius pulled his potion out of his pack and handed it to Turenim. With only three bugbears still standing, Lee slashed Talon at the second bugbear again, this time in the other shoulder. The bugbear, enraged, brought his morningstar down on Lee’s head, crushing Lee to the floor. The fourth bugbear took a swipe at Moula, but she was too swift. The last bugbear reached for Albrecht, but swung short. Moula swung her staff at the bugbear that dropped Lee, cracking its skull, and caught the sixth bugbear on the reverse swing, smashing its face in two. Albrecht stabbed the fifth and last remaining bugbear with his rapier. The bugbear grinned briefly and then grabbed at its head as the damage from Albrecht’s physic blade finished it. “Ha, ha, ha, ha!” they all heard from outside. Moula, Albrecht, Pippin, and Julious tried to make their way in the complete darkness to a wall in hopes of finding the door. Turenim and Moula called out to each other, but when he tried to reach her, he stumbled. Moula found her way to him and he cast guidance on her. Atilius used his keen mind to make his way out of the room and into the starry cavern, but suddenly felt sticky strands of web restrain him. With all his might he was able to rip himself free. Lee, Turenim, and Pippin were stuck with sticky webbing as well. Julious managed to find the door to the forge room. Turenim and Pippin tried, but could not free themselves from the webbings. Atilius took a few more steps and left the sphere of darkness behind him and the light of his ring lit up the starry cavern. He looked up just in time to see a bright blue-white light streak towards him as a ray of frost hit him square in the face. Julious made his way to the double doors of the forge room, heading to the starry cavern. Moula and Albrecht were both struck by webbing. With the benefit of Turenim’s guidance, Moula freed herself from the webbing and tried to make her way to Lee, but could not find him in the dark. Turenim freed himself from the webs, but could not find his way out of the room. Atilius, recovered, found himself face to face with a smirking male drow, and cast witch bolt with spell sniper, at who was presumably The Black Spider himself. But the drow flicked his wrist and Atilius’ spell fizzled as soon as it was cast. Julious, watching the drow and Atillius’ exchange from the forge room doorway, shapeshifted into a wolf. Pippin broke free from the webbings that had restrained him, but was almost immediately webbed again. Moula was bit by a large hairy beast. She swung wildly in the dark and managed to hit the beast twice with her staff, and it squealed in response. Lee and Albrecht broke free from the webs that restrained them, but could not make their way out of the room. Turenim made his way to Pippin and cut the boy free of the webs with his dagger. Pippin was unable to find a door, but stabbed at the hairy beast in the room, making it squeal horribly. Outside, Atilius opened the small box from Cragmaw Castle and flung the swab inside at the drow. “Ha, ha,” the drow began. “Is that the best y-” and his voice was cut off as he was surrounded in silence. The drow turned to escape the silence surrounding him, but Julious, as a wolf, leaped into the silence and on top of him, pinning him down and tearing at his flesh. From under the wolf’s weight the drow aimed his staff at Atilius, but no sound came out of his moving lips, and nothing happened. Inside, Moula and Pippin were both struck by webs again. Lee tried to find his way out of the room, but stumbled and fell. Moula broke free of the webs. Albrecht also fumbled around in the dark, and stabbed one of the hairy beasts. 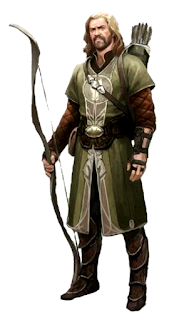 Turenim used his ability to channel divinity to preserve life for Moula, Lee, Atilius, and himself. Pippin struggled, but could not break free of the webs. Outside, the drow swung feebly at the wolf on top of him. Atilius threw a fire bolt at the drow, trying not to hit Julious, but it skidded wide. Julious continued to tear into the drow with his wolf’s teeth. Unable to maintain any concentration, the darkness disappeared and the area was flooded with light from Atilius, Turenim, and the forge room. They all beheld the giant spiders groping at them. Pippin stabbed at the giant spider hovering over him. Inside, Moula and Turenim were stuck with webs. Lee ran into the forge room. Moula and Pippin broke free of the webs, but Albrecht and Turenim struggled in them. Outside, the drow struggled to get out from under Julious, but was unable. Atilius threw a fire bolt at the drow, grazing him. Julious continued to tear into the drow with his wolf’s teeth. Inside, giant spiders tried to web Moula and Pippin, but could only catch Pippin. The fourth spider bit into Albrecht. Lee slashed into the giant spider that followed him into the forge room. Moula smacked the giant spider hovering over her, knocking it off the wall, but it kept coming at her. 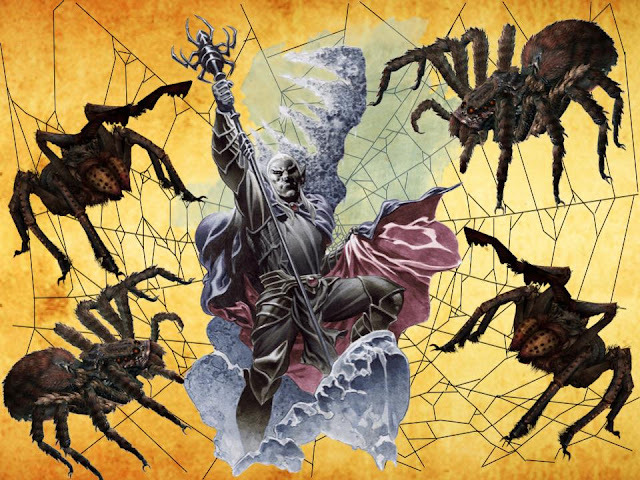 Albrecht broke free from the webs and was bit by a giant spider as he ran out of the room, passed Atilius, towards the drow. Turenim broke free of the webs, but Pippin could not. The drow squirmed its way out from under Julious the wolf, and tried frantically to escape from the silence, allowing Julious to claw at it, but the wolf’s claws could not penetrate the drow’s cloak. Atilius cast witch bolt at the drow, but missed. Julious pounced on the drow again, tearing into him, and pinning him once more. Still stuck in the silence, the drow’s curses went unheard. Giant spiders webbed Moula and Turenim, and another bit into Pippin. Lee ran from the forge room into the starry cavern, towards Julious and the drow. Moula broke free of the webs and swung at the giant spider that she had previously knocked off the wall, sticking her staff through its head, killing it. Albrecht reached the drow, stabbing him with his rapier. Atilius turned and hit one of the giant spiders coming after Albrecht with a fire bolt. Pippin broke free of his webs, and stabbed the giant spider hovering over him, making it squeal miserably. Julious continued to rip into the drow from above. A giant spider was unable to web Pippin, but another webbed Atilius. The last giant spider bit into Atilius. Lee and Albrecht swung at the drow, but could not catch him in the fray. Moula swung at the giant spider that was following Lee, whacking it once with her staff and then sticking her staff through its head, killing it. Turenim and Atilius broke free of the webs. Pippin stabbed at the giant spider hovering over him, finally killing it. The drow almost broke free of Julious the wolf’s weight, but Julious held him down, but still could not claw through the drow’s cloak. The last giant spider tried web Atilius, but Atilius was able to evade it. Lee continued to try to get a clean shot at the drow with Talon, but couldn’t. Moula rushed the last giant spider that was attacking Atilius, again smacking it down and driving her staff through its head, killing it. Albrecht stuck his rapier into the drow, and it stopped moving. With the drow down, the group moved out of the silence and heard clapping in the darkness from the cavern beyond. Then out of the darkness stepped Ivor with both swords drawn, and one of them at the throat of a woman, who looked like a young Halia Thornton. Albrecht recognized this woman as his fiance, Edith Lestange. “Why would we leave with you here?” Lee asked.